The latest leaked images have finally confirmed one of the most widely-rumoured features planned for the new flagship smartphone – an in-display fingerprint scanner. The feature was purportedly planned for the Galaxy Note 9, but failed to make an appearance in the final product. However, it looks like Samsung is now ready to unleash its new system, developed with chip manufacturer Qualcomm, which allows smartphones to press their fingertip on the glass display to login and authenticate payments. 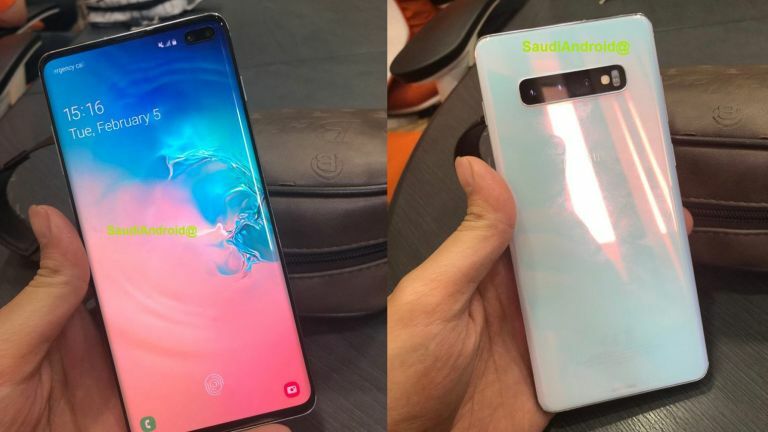 The latest leaked images of the Galaxy S10, spotted by Samsung-centric blog SamMobile, originate from Saudi Arabia. This proves that Samsung has finalised its design and is now mailing out units across the world in preparation of the launch next week. It’s tough to say exactly where the images come from, but it's likely to be an overly enthusiastic worker at a local PR agency, or an internal Samsung office. The photographs capture the Samsung Galaxy S10 and Galaxy S10 Plus. The images prove earlier whispers that both of the smartphones will have the same rear-mounted triple-camera and slightly less curvaceous dual-curved Infinity-O display. It also reveals that Samsung will ditch the rear-mounted fingerprint scanner on the Galaxy S9 and Galaxy S9 Plus. The leaked Galaxy S10 images show a small fingerprint icon in the lower-half of the screen – the clearest proof yet that the biometric sensor will be embedded beneath the glass display. It's unclear whether earlier rumours that Samsung Galaxy S10 owners will be able to place their fingertip almost anywhere on the glass to authenticate their print are accurate, or whether it will be limited to an area on the screen about the same size as existing physical scanners. Regardless, Samsung looks set to use a more secure ultra-sonic in-display sensor. Unlike traditional optical sensors, the ultrasonic variant does not compare the print against a two-dimensional pattern previously stored. Instead, the system creates a three-dimensional mould of the fingertip by bouncing soundwaves off the skin through the display. This will purportedly allow for a much greater level of detail – down to the individual ridges and pores. T3 will have all of the latest information from Galaxy Unpacked as soon as it's announced on-stage, so stay tuned. Samsung will also have a livestream of the keynote on its website, which will kickstart at 7pm GMT (2pm ET, 11am PT) on February 20, 2019. Online pre-orders will go live the following day, Samsung has seemingly confirmed in a new "Register Your Interest" webpage for fans. However, the Galaxy S10 handsets aren't expected to be available in stores worldwide until March 8, 2019. As for what else might be launched at the Unpacked event, we could get an unveiling of the Samsung Galaxy Sport smartwatch, and maybe might even a pair of smart running shoes.